Here's a flavorful, quick breakfast for two, or one adult and a couple of kids. Put 1 c oats, 1 c milk, 1 1/4 c water, and a sprinkle of salt in a medium saucepan over high heat. Grate the zest from the orange and add it to the pot. When the liquid comes to a boil, turn the heat to low and cook, stirring occasionally until the liquid is just absorbed, 8-12 min. Put 2 T butter in a medium skillet over medium heat. When the butter starts to sizzle, add 3/4 c pecans and 2 T maple syrup. Cook, stirring frequently and adjusting the heat so the syrup doesn't burn, until the pecans are coated and caramelized, 3 or 4 min. Turn off the heat. When the oatmeal is done, divide it between 2 bowls. 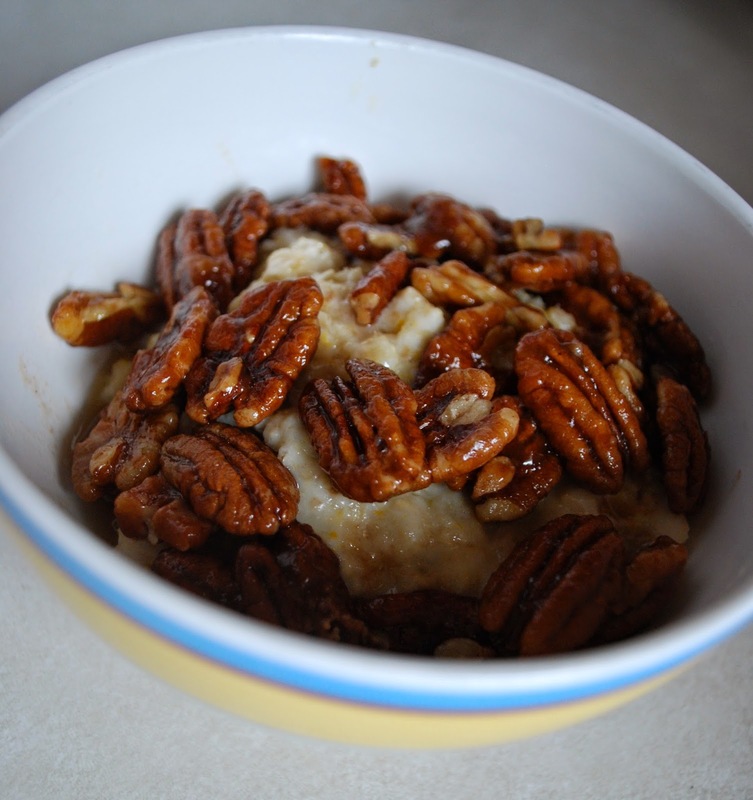 Top with the pecan mixture, drizzle with a little more maple syrup if you like, and serve. Note: The first time I tried this recipe I made it with unsweetened almond milk. The texture and flavor were fine but I did require more syrup. We've been on a bit of a Bittman kick while Betsy has been enjoying her copy of his latest cookbook. Some others of the family must have Bittman on our minds, too. Just a few days before Christmas, Tom and Sol treated Ty, Andrea, Leon, and me to these burgers in Amsterdam. They are juicy, flavorful, and beautiful, especially when garnished with sauteed tri-color peppers and fennel. Sol likes to grill up a few jalapenos, too. Place fennel and garlic into a food processor and pulse until just chopped; place in a large bowl. If any of the pork cubes are mostly fat, place those in the processor and run the machine until the fat is just chopped. Working in batches, process the remaining meat with seeds, salt and pepper, until meat is just chopped (be careful not to over-process). Add to the bowl and mix well. Shape mixture into 8 patties. To broil or grill, the heat should be medium high and the rack about 4 inches from the heat source. Cook the patties about 5 minutes on each side, turning once and then again if necessary, about 8-10 minutes total. On the stovetop, heat a large skillet or griddle over medium heat (know your stove and adjust accordingly) and add patties; cook undisturbed for about 3 minutes then rotate them so they brown evenly. When browned, turn over. Total cooking time is about 10 minutes. The patties can remain slightly pink in the center. Garnish and serve on buns, or not. Michael and I both adore these Brussels sprouts. I've eaten Brussels sprouts a number of ways, and so far this is my favorite. Rarely do sprouts inspire second helpings, but these do, for both of us. As I've tried more recipes from How to Cook Everything Fast, I've learned that Bittman's prep times are shorter than they are for me in real life. Whether that's because I have no culinary training or that I have little people around that interrupt me as I'm making dinner, I don't know. So I've had to make a few adjustments to the "prep as you go" nature of the recipes. This is one that I've made a couple of times already, and I expect it will make this vegetable much more common on our plates. Trim about half of the sprouts: cut off the bottom and remove the first couple of leaves from each sprout. Put 2 T olive oil in a large non-stick skillet over medium heat. Chop 6 slices bacon and add them to the skillet. Cook the bacon, stirring occasionally, until it releases some fat and crisps in places, 5-7 minutes. While the bacon cooks, finish trimming the sprouts. Add the Brussels sprouts to the partially cooked bacon, along with a sprinkle of salt and pepper and 1/2 c water. Cover and cook, checking once of twice and adding small amounts of water as needed, until the Brussels sprouts are a little shy of tender, 8-12 minutes, depending on their size. Remove the cover and raise the heat to high. Cook, resisting the urge to stir too much, until the liquid evaporates and the Brussels sprouts become brown and crisp in places. Taste and adjust the seasoning and serve hot or warm. While at Betsy's house during the week of Halloween, we made this drink with juice from mystery grapes grown in my garden and bottled in my kitchen this summer. On colder winter days I've made it at home, too. Warmed like this, it is much like hot apple cider but a bit more rich. Dilute home made grape juice with 1 quart water. Stir it (or whichever kind you are using) together with other ingredients in a pot and bring to a simmer on the stove-top or in a slow-cooker. Turn off heat and let steep for at least 20 minutes before serving in mugs. Frittatas (an Italian variation of omelets) are among my favorite quick meals and usually around my house this egg dish is a hodge-podge of whatever ingredients I can find. Although this means they are never the same, this method has the advantage of using up small portions of foods and increasing variety in our diets. I cook this frittata whenever I have left over salmon. Even if you can't find arugula easily, you should try this. You might try thinly sliced cabbage or radishes as a garnish, instead. This is how I make frittata for Leon and me, although two thirds become leftovers, so this would be enough to feed four. These are general guidelines since every time I make this, it is somewhat different. Don't be afraid to try this even though directions are non-specific. I've never had a bad frittata. cheese: a couple of handfuls of Cheddar (I prefer sharp), Jack, Manchego, Asiago, Gruyere, Emmentaler, smaller amounts of Parmesan. I find that mozzerella is too mild but it could be used, especially if you combine it with Parmesan. herbs: if you have them...chopped parsley, chives, cilantro, thyme...these are particularly nice if you don't have a green vegetable already in the mix. While the dish is cooking, clean and dry the arugula, tearing it into bite-sized pieces, if preferred, and place a couple of handfuls on each plate.When the frittata is finished, cut into wedges and nestle into the arugula and serve. Betsy once pointed out that our comfort food file contains many foods with chocolate as a major component. As much as I love chocolate and find it comforting it is not the only food that I turn to when I need a boost. Although some savory comfort foods are the mainstays of my winter meals, they are worth cooking any time of the year. When I was a young mom, my husband received an Air Force assignment to a location I'd never heard of and on a globe it showed up as a dot the size of a pinhead, Bahrain. As it turned out the whole family was fortunate enough to accompany Leon for three years of adventure. Of the gulf countries Bahrain ran out of its oil money early and at the time it was beginning to establish itself as a banking center. The island had not taken on the glitzy character of a Las Vegas on steroids. There was much that was still undeveloped and reflected the old culture of the Middle East. We liked to frequent a restaurant that had no sign with its name in English or Arabic. The proprietors drew attention to the place by spotlighting high ropes sporting red and white flags which waved in the wind. We came up with our own name, calling the place "Twenty-seven Flags." It was here that I first tasted homey, warm, and humble lentil soup with the perfect amounts of spice and lemon. This particular recipe comes very close to my memories of the Bahraini soup and deserves a place in the comfort food file because just one whiff takes me back to a lovely time in my life. The authors of this recipe recommend using Lentils du Puy, a French green lentil. That said, you can use almost any tan, black, or brown lentil but cooking times may vary depending on the type of lentil you choose. Fry bacon in a 4-quart heavy saucepan, stockpot, or Dutch oven over medium-high heat until fat is rendered and bacon is crisp. Remove from pot with slotted spoon and set aside. Remove all but 1-2 T fat from pan and add onion and carrots, cooking and stirring occasionally until vegetables begin to soften. Add the garlic, cumin, coriander, cinnamon, and cayenne; cook for about 30 seconds until fragrant. Stir in the tomatoes, bay leaf, and thyme and cook for a minute or two. Stir in the lentils, salt and pepper. Cover and reduce heat to medium-low and cook until the vegetables are softened and the lentils have darkened, 8-10 minutes. Uncover, raise the heat to high, stir in the wine and cook for a minute while the wine simmers. Add the broth and water and bring to a boil. Reduce the heat to low, cover partially, and simmer until the lentils are tender but retain their shape, about 30-35 minutes. Discard the bay leaf. Puree 3 c soup in a blender until smooth. Return to the soup and stir. Add the bacon, lemon juice, and 2 T cilantro, using 1 T to sprinkle on top before serving. Everyone in the family has loved this little truffle. And they come together really quickly--about 15 minutes hands-on time, with 15 minutes in the freezer. Put 2 T butter in medium microwave-safe bowl. Chop the chocolate and add it to the bowl. Microwave the mixture, checking and stirring occasionally until the butter and chocolate melt, a minute or two. Add 1 c peanut butter and stir until it's evenly incorporated. Blend in 1 c powdered sugar and stir until the mixture is smooth. Put a piece of wax or parchment paper on a rimmed baking sheet. Use 2 teaspoons to drop 1-inch balls of dough onto the sheet. Sprinkle the tops with a little salt. Put the baking sheet in the freezer and freeze just until the balls firm up a bit, 10-15 minutes. Serve. The balls will stay firm in the fridge; store in an airtight container in between layers of wax paper. Depending on the size of your crowd, there may not be any left! If you have more time, try rolling the balls in finely chopped peanuts before freezing. Note: You may want to play with the sugar amounts in this recipe until it matches your taste for sweetness. The original recipe called for 4 oz of either semisweet or bittersweet chocolate, as well as 1 full cup of powdered sugar. Bittman's new cookbook reminded me of a favorite recipe in another of his cookbooks. It takes about 20 minutes total, including preheating time, and is totally worth it. I like to throw in some high-quality chocolate chips for a real treat! I have used peanut oil and vegetable oil. The nut oil does impart more flavor, but storage is trickier because it goes rancid faster. I keep the peanut oil in the fridge--but then have to remember to take it out in enough time so it is totally liquid. (I have placed the bottle in front of the vents for the preheating oven, but that can melt the bottle!) Other nut oils would be good, I'm sure, but they tend to be more expensive. Vegetable oil works just fine, too. Preheat oven to 450F. 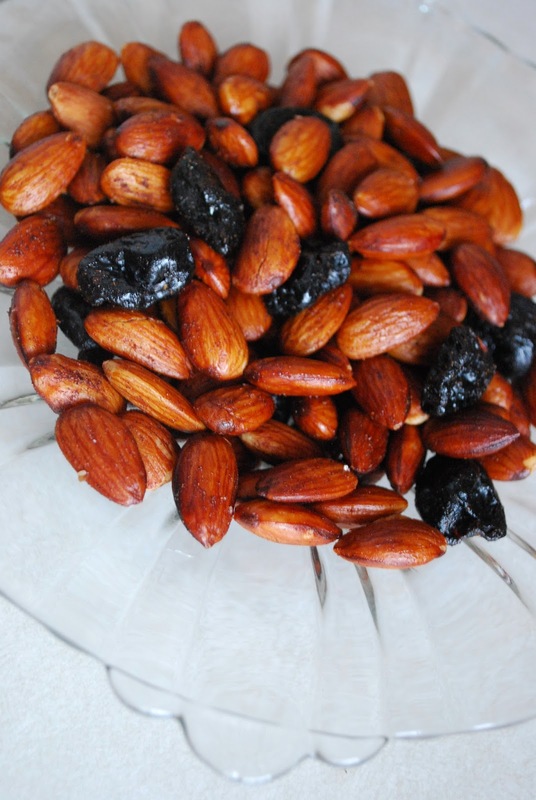 Place the nuts on a rimmed baking sheet, drizzle with oil, and toss well until evenly coated. Roast, shaking the pan occasionally, until lightly browned, about 10 minutes. Transfer the warm nuts to a bowl. Add the fruit and cinnamon, then salt to taste. Cool briefly then serve. Store in an airtight container. Note: This recipe has many successful variations. The one above is my favorite, but you can use any combination of raw, shelled nuts or seeds as well as a number of herbs or spices. Bittman suggests 2 T minced fresh rosemary, 2 teas ground cumin, a pinch or so of cayenne pepper, 1 teas ground cardamom, or 1/2 teas ground nutmeg or cloves in exchange for the cinnamon above. Also, you can play with the ratio of fruit to nuts. I used dried cherries in my latest batch, and people kept eating the cherries out of the mix, so next time I'll add maybe an extra cup of cherries. During our five years in Europe, we lived in Belgium and Germany, both within easy reach of the city Strasbourg, a lovely French city on the Rhine River. When we visited the whole family loved to eat a dish, similar to my Mom's pot roast (but better) baked in a decorated clay pot. Since I had purchased a few of the pots, I tried to imitate the dish at home. This was long before easy access to recipes online and cookbooks were hard to come by so my efforts, though appreciated and eaten, weren't authentic. In later years I found a recipe that has served as a guide and taught me to add some white wine to the marinade (which really does improve the flavor). Apparently Baekoffe is an old dish that got its name because home cooks would bring their pots to be cooked in the residual heat in local bakery ovens after a day's baking had finished. It is homey, satisfying, and unpretentious. One of the coldest days I spent in those years was in this Alsatian region, a day late in December. We visited the town of Colmar a bit south of Strasbourg and our destination was an unheated old stone cathedral serving as an art museum. It was cold inside and out and even with six layers on, I was uncomfortably cold until we ate dinner. Sitting down to a steaming hot Baekoffe was just about as good as it comes. This is a true winter-time comfort food to me because it reminds me of days when meals with my kids weren't rare and because it is just plain great to eat. I found this years ago on the internet and didn't keep record of the source. Cut meat into 3-inch chunks and place in a large bowl. Add the herbs, garlic, and cracked peppercorns. Pour wine over the mixture and marinate overnight. Remove meat from marinade. Season with additional salt and pepper. Heat oven to 325F. Butter the inside of a 3-quart earthenware casserole. Begin with a layer of potatoes and onions (season each layer with salt and pepper), then add a layer of combined meats. Continue alternating layers, finishing with a layer of potatoes. Pour marinade over all, place the bay leaves on top, and cover the pot. Bake for 2 1/2 to 3 hours. This is a great recipe to use when you've got an abundance of cherry tomatoes and also in the winter when grape tomatoes are the only decent variety in grocery stores. I haven't tried it, but I imagine that another type of bean could be substituted for those who don't care for chickpeas; cannellini beans for example. Combine 2 T olive oil, 1 teas coriander, 1 teas paprika, cayenne, and 3/4 teas salt. Rub the cod evenly with the mixture and place in a ziplock bag or an airtight container to marinate in the refrigerator for at least an hour or up to 24, turning and flipping cod occasionally to ensure even marination. Combine chickpeas, tomatoes, broth, shallots, garlic, lemon zest and juice, remaining T olive oil, remaining teaspoons of coriander and paprika in a 9X13 baking dish. Cover, place in the refrigerator and allow to marinate for the same amount of time as the cod. To finish: Place oven rack in middle position and heat oven to 400 degrees. Season chickpea mixture with 1/2 teas salt and 1/4 teas pepper. Nestle cod into chickpea mixture and bake until cod flakes apart when gently prodded with paring knife and registers 140 degrees, about 20-24 minutes. Drizzle with oil and sprinkle with cilantro to serve. Creamy and flavorful, with a satisfyingly crunchy top. Note that the gratin is better fresh, and not as good left over. I may try to halve it next time, and use the remaining squash in another way. Also, I see this mostly as a vegetable side, but Bittman suggests that paired with a green salad and some crusty bread it would make a light meal. You'll notice that Bittman repeats amounts of ingredients in the recipe instructions. This saves a little bit of time since you don't have to check back at the ingredient list. Cut the squash in half crosswise, trim and peel it, scoop out and discard the seeds, and cut it into chunks. Shred the squash in a food processor with a grating disk (by far the easier method) or by hand with a box grater. Chop the sage leaves, if you're using fresh sage. Put the squash in a 9x13-inch baking dish. Add the sage, 2 T olive oil, and a sprinkle of salt and pepper; toss and spread in an even layer. Pour 1 c cream over the top. Cover the baking dish with aluminum foil and bake until the squash is tender and the cream is bubbly and thick, 15-20 minutes. Chop 1 c nuts. Grate 1 c Parmesan. When the squash is tender, uncover the dish, sprinkle the cheese over the top, and sprinkle with the nuts. Return to the oven and bake, uncovered, until the top is lightly browned, about 5 min or more. Let cool for 1-2 minutes before serving. Not long ago I came across Mark Bittman's recent cover story in Time Magazine, "The Truth About Home Cooking." His goal in the article is to encourage more people to cook at home, since it's healthier and can be cheaper. Bittman claims that cooking shows and instagram streams--and I would add cooking blogs!--have made a fetish of food. We now think that if we cook and eat at home, it must be fancy food that takes hours to prepare. He says we should dial back those expectations for everyday eating--and that it is still possible to end up with delicious (and healthy) food. As part of the article Bittman offers a meals' worth of quick, easy recipes to help you get started, even if you feel like you don't know how to cook. A page from How to Cook Everything Fast, with the prep work in blue. So much of Bittman's approach really resonates with me, as the main cook for a growing family. Meals that take a long time have their place, but what I always need more of are quick simple meals that taste good. I firmly believe in the importance of home cooking, for health, environmental, and social reasons. Yet I'm also raising 2.5 children right now, work part-time outside the home, and have volunteer obligations, so there's a lot on my metaphorical plate--I don't have time to cook for hours every day. My lovely husband gave me How to Cook Everything Fast for Christmas, and I've been trying about one recipe a day. They're so approachable it's been easy. (And I am getting absolutely no kickback from highlighting this cookbook, so my motives are honest!) So you will start to see a lot of Bittman recipes from me. I don't usually make New Year's resolutions, but in 2015 I'm looking forward to lots of good, fast cooking. And of course, delicious eating around the family table.